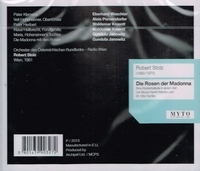 “The great-nephew of the soprano Teresa Stolz, Stolz was born of musical parents in Graz. His father was a conductor and his mother a concert pianist. At the age of seven, he toured Europe as a pianist, playing Mozart. He studied at the Vienna Conservatory with Robert Fuchs and Engelbert Humperdinck. From 1899 he held successive conducting posts at Maribor (then called Marburg), Salzburg and Brno before succeeding Artur Bodanzky at the Theater an der Wien in 1907. There he conducted, among other pieces, the first performance of Oscar Straus' DER TAPFERE SOLDAT (The Chocolate Soldier) in 1908, before leaving in 1910 to become a freelance composer and conductor. Meanwhile, he had begun to compose operettas and individual songs and had a number of successes in these fields. After serving in the Austrian Army in World War I, Stolz devoted himself mainly to cabaret, and moved to Berlin in 1925. Around 1930, he started to compose music for films, such as the first German sound film ‘Zwei Herzen im Dreivierteltakt’ (Two Hearts in Waltz Time), of which the title-waltz rapidly became a popular favourite. Some earlier Stolz compositions, such as ‘Adieu, mein kleiner Gardeoffizier’ from his operetta DIE LUSTIGEN WEIBER VON WIEN, became known to wider audiences through the medium of film. The rise of Nazi Germany led Stolz to return to Vienna, where his title-song for the film ‘Ungeküsst soll man nicht schlafen gehn’ was a hit, but then came the Anschluss, and he moved again, first to Zürich and then to Paris, where in 1939 he was interned as an enemy alien. With the help of friends he was released and in 1940 made his way to New York. In America, Stolz achieved fame with his concerts of Viennese music, starting with ‘A Night in Vienna’ at Carnegie Hall. As a result, he received many invitations to compose music for shows and films, and he received two Academy Awards nominations. In 1946 Stolz returned to Vienna, where he lived for the rest of his life. In the 1960s and 1970s he made numerous recordings of operettas by composers such as Johann Strauss, Franz Lehár, Emmerich Kálmán, and Leo Fall, whom he had known previously. In later years he used a baton inherited from Franz Lehár, that had been originally owned by Johann Strauss and contained Strauss' initials engraved in silver. "Gundula Janowitz was one of the best lyric sopranos of her time, with a pure and very beautiful voice and a large opera and lieder repertory. She was a highly valued member of the Vienna Opera for over 30 years…." "In 1955, Kmentt sang Jaquino in Beethoven's FIDELIO for the reopening of the Vienna State Opera, and performed internationally in roles such as Mirko Zeta in THE MERRY WIDOW until the turn of the century. During all this time, the tenor Waldemar Kmentt gave countless dazzling performances on the world's greatest opera stages. This portrait in honour of his 80th birthday is an impressive reflection of his versatility, with excerpts from roles he performed at the Vienna State Opera, where he was based, and where he received the title of 'Kammersänger' and was eventually made an honorary member. The flexibility and brilliant timbre of his voice brought him many roles at the State Opera, both in the legendary Mozart Ensemble under Karl Böhm and as an 'Italian' tenor (though, as usual at that time, mostly in German). A brilliant rendering of the Italian tenor’s aria from DER ROSENKAVALIER in 1968 under Leonard Bernstein, concludes the cross-section of the prodigious career of a tenor who, ever modest, never relied on mere showmanship. In 1953 Eberhard Wächter made his operatic début as Silvio at the Vienna Volksoper. From 1954 he was a member of the Vienna State Opera, and in 1963 he was named as Austrian Kammersänger. He made his début in at London’s Covent Garden as Count Almaviva and his first appearance at the Salzburg Festival as Arbace in IDOMENEO in 1956. In 1958 he made his début at the Bayreuth Festival as Amfortas. He sang for the first time at the Paris Opéra as Wolfram in 1959. In 1960 he sang Count Almaviva at his débuts at Milan’s La Scala and Chicago’s Lyric Opera. In 1961 he made his Metropolitan Opera début as Wolfram. In subsequent years, he continued to appear regularly in Vienna, where he created the rôle of Joseph in Einem’s JESU HOCHZEIT in 1980. In 1987 Eberhard Wächter became director of the Vienna Volksoper. From 1991 he was also co-director of the Vienna State Opera."